Sure looks as if the vaccine wiped out that tumor, eh? Not so fast. As some medical experts were quick to point out, this tweet was deceptive in a number of ways. 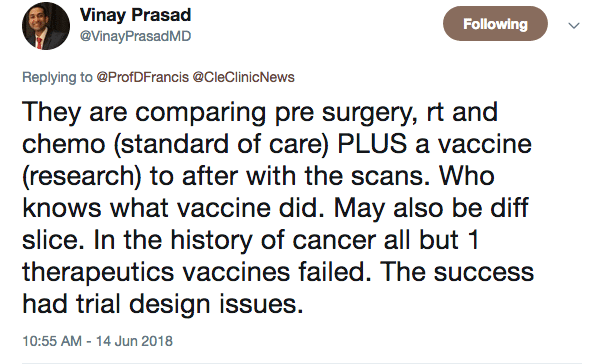 But perhaps more misleading was the message implied by the tweet: that the experimental vaccine was responsible for demolishing the tumor. 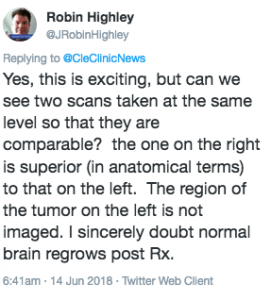 A look at the news release linked to the tweet revealed the man also underwent standard therapy for glioblastoma, also known as glioblastoma multiforme, or GBM. That standard therapy consists of surgery to remove the tumor followed by chemotherapy and radiation. Since both the experimental vaccine and the standard treatment were given in between the time those images were taken, it’s not possible to know which intervention made the difference. The news release, entitled “Immunotherapy Vaccine Shows Great Promise in Treating Brain Cancer Patients,” didn’t acknowledge this problem. 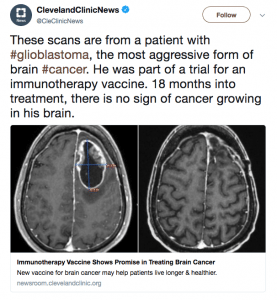 In fact, it unabashedly led off by asserting that adding the vaccine to standard treatment “is improving outcomes” for patients with glioblastoma. Much further down the news release quoted a researcher saying “we are still in the relatively early phases of testing this vaccine” and mentioned plans for a randomized trial to be conducted. 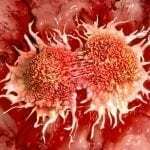 According to the news release, the vaccine, called SurVaxM, stimulates the immune system to kill tumor cells that contain survivin, a protein that helps cancer cells resist conventional treatments. 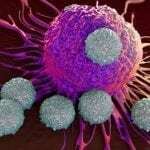 It was developed at Roswell Park Cancer Institute in New York and is being developed by a company called MimiVax. They found that 91% of patients receiving SurVaxM as part of this hybrid therapy were still living 12 months after starting treatment, compared to 61% in a historical analysis of patients treated with standard therapy alone. 96% of patients achieved six-month progression-free survival, compared to 54% among the historical comparison group. 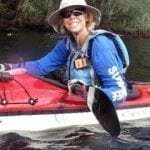 13 of 63 patients continue to be without progression a year or longer into their participation in the study. Thirteen out of 63 patients being “without progression” of their tumor after at least a year doesn’t sound like a slam-dunk. But there was more essential data missing. The news release didn’t tell us what types of patients received this vaccine. Were they similar to those used to calculate the historical survival data? According to the American Cancer Society, a person’s age, overall health, and tumor location can affect survival, estimated at 19% after five years for people ages 20-44 to 5% after five years for those ages 55-64. Those numbers come from the Central Brain Tumor Registry of the United States and are based on people diagnosed from 2009 to 2013. Glioblastoma usually recurs, and early observations about experimental therapies based on comparisons with estimates based on patients treated in the past can be deceiving. 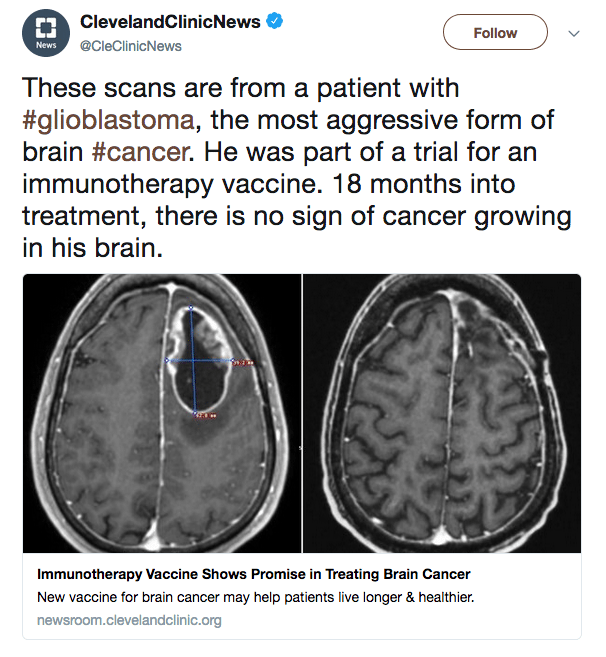 Here’s a cautionary story involving another glioblastoma vaccine: In 2015, a company called Celldex Therapeutics received the FDA’s “breakthrough therapy” designation for its Rintega for GBM patients who tested positive for a variant of a molecule called the epidermal growth factor receptor, which is associated with poor survival. The company cited median overall survival of 21.8 months for patients who took the drug versus 16 months for a historical control of patients. Not even a year later, Celldex ditched the trial, saying the vaccine wasn’t working. Cleveland Clinic’s publicity department has a track record of promoting misleading hype. So why does this tweet matter? We’ve written before about the ethical issues raised by cancer centers promoting clinical trials as a patient benefit in order to enhance their brands, spelled out recently in JAMA Oncology. Such marketing promotes the false notion that experimental methods are likely to work, which undermines the purpose of a trial, said the authors. 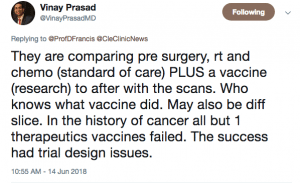 One of them, Alex John London, PhD, a professor of ethics and philosophy at Carnegie Mellon University, called the Cleveland Clinic’s brain cancer vaccine promotion “very troubling” and an example of how evidence-based medicine can be undermined. 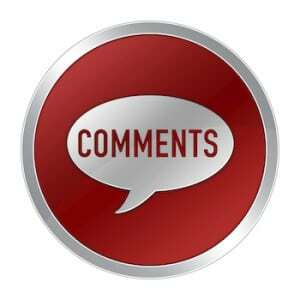 “The press release says that there will be a phase 3 randomized trial. But who would want to be randomized when they are focusing on a single case that portrays the vaccine as a silver bullet? They are advertising on the basis of the promise of clinical benefit without acknowledging the uncertainties that remain,” London said via email. This case seems even more fraught than general marketing of clinical trials because a particular patient’s story and images are being used. With his oldest son about to go off to college at the University of Texas at Austin, Jeff is looking forward to spending a normal summer of trips to the local pool with his family, while continuing his career as a program manager for Microsoft. That’s a result that thousands of people who have these tumors along with their families can only dream of. Dangling the very uncertain prospect of a cure — and a future of happy family outings — seems perilous.